Recently the Portuguese metallers of Moonshade released their album called Sun Dethroned. DutchMetalManiac’s Tim van Velthuysen already reviewed Sun Dethroned here. 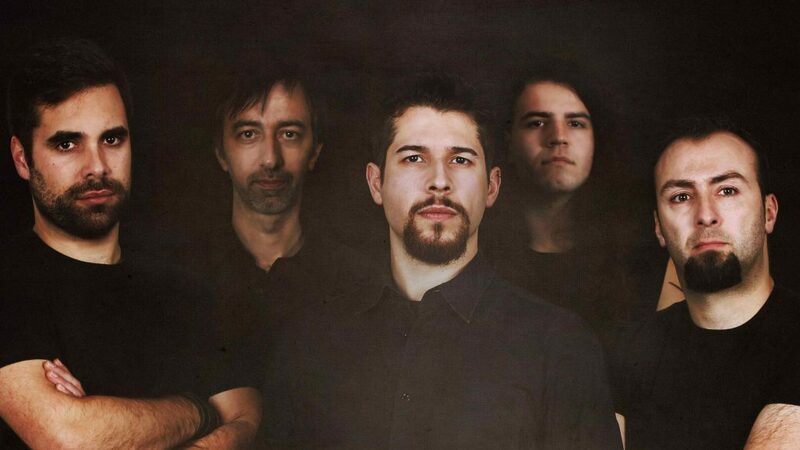 Now you can check his interview with Daniel Laureano and Nuno Barbosa of Moonshade below. Daniel: Hi guys, we are very fine, thanks. Nuno: It’s a pleasure to be talking to you. Congratulations with your new album, Sun Dethroned, I really like it! Nuno: Thanks man. We are really proud of our work and it makes us very happy to know that people are enjoying it. Many thanks for your support and your interest in talking to us. How did the creating process of Sun Dethroned go? Daniel: It was a very morose and meticulous process, albeit one that ended up being quite gratifying. We dedicated a lot of time and put a lot of effort into all the stages of making this album, something that was made with the sole objective of allowing ourselves to craft a piece worthy of our highest expectations. About 3 years were spent, from the moment we started composing the songs to the moment we listened to the final product for the first time, and the events that happened during those years weren’t always easy to deal with. It’s really difficult to please five personalities. Everyone has their own ideas and tastes and everyone in Moonshade likes different genres of music. Everyone has a day job so our time is very limited to be together and compose music. Adding also that we always try to come up with ideas that all of us really like. Those are the main reasons that took us all this time to put this product out. But finally it is here and we are very happy with it. For both of you this is the first Moonshade-release you’re part of. However you are already Moonshade-members since 2015. Did this bring any differences during the creating process? If so, can you tell something about that? Daniel: Trying my best to be objective whilst talking about Nuno and myself, I think our arrival was a big part of the creative shift that Sun Dethroned ended up representing in Moonshade’s catalogue. That wasn’t felt solely on what each of us brought to the table individually, but also in the way that the other members themselves ended up being influenced by our ideas and methods, all the while influencing us with their own, creating a great environment of shared ideas. Nuno’s influence in terms of the orchestrations was the first big impact that we felt, as we had never worked with a keyboard player before. Afterwards, when he took up the bass, he elevated our compositions with some pretty elegant and subtle bass lines, which really made some aspects of the songs shine even more. Nuno: As for Daniel, he brought his own compositional style, which calls upon a lot of different influences in terms of artists and bands, whom we weren’t necessarily used to. Things that range from Dead Can Dance to Rotting Christ or even David Bowie, to name a few, all came together to mold our sound even further. Sun Dethroned sounds really heavy and really melodic at the same time. How do you manage to get the right balance in this? Nuno: Music is a very intricate form of art. Something that sounds good to us wouldn’t necessarily sound good to others, so our main objective was to make music that we all ended up liking. Combining the riffs from Pedro and Daniel’s guitars, which sound really heavy in some parts, with the bass lines and orchestrations that Nuno came up with is what makes Moonshade’s true self come to light. When writing these songs, most of the times it all started with a guitar riff as well as a melody attached to it and we went from there. Afterwards Nuno added up some atmospheric orchestrations in the keyboards – not limiting himself to play exactly what the guitars were playing, but really adding some arrangements that would bring more melody to the songs. That’s really how we got to these songs. When you listen to our album you will listen to some influences from other bands, of course, but we think we have our own signature sound. When you hear it, you’ll know exactly that that’s Moonshade. You recently had a listening party for Sun Dethroned. How were the responses you got on the album? Daniel: So far, they have been very good. People seem to be thoroughly enjoying our hymns to sadness and loss, which is something that pleases us, but also makes us feel a bit scared about what some of those people’s perspective of life might become after being exposed to the story we told here! You’ll release Sun Dethroned via Art Gates Records. What makes them the best label for Moonshade at this moment? Nuno: We had a couple of offers from some labels, but Art Gates Records was the only one that offered all we needed. Their roster was great and we thought that it would be good to us to be part of the AGR family. They are taking us to the next level, making our work reach all regions of the planet which is very important to us, as we are looking forward to be performing outside of Portugal and we think AGR will help us with that too. So, after talking with them a few times, we felt their drive, their professionalism, their commitment, and signing with them was a very comfortable decision for us. You hail from Portugal, any Portuguese bands you’ll recommend to check out? Daniel: Absolutely. There are a lot of great bands in our home country who definitely deserve more ears to be placed upon them. Talking mostly about newer bands, some names come to mind: Gaerea, Destroyers Of All and Sinistro – or Dark Oath, Analepsy and The Ominous Circle – among others, are all definitely worth checking out, so do yourselves a favor and type in their names in your nearest YouTube search box. In December you will play two special Sun Dethroned release concerts. Looking forward to those shows? Daniel: We are extremely excited with those shows, as they will be our first gigs following a near-2 year stage absence. We are working hard to prepare everything down to every detail, to make them worthy celebrations for our new record. Whoever comes to see us won’t be disappointed. Anything special planned for those shows? Daniel: Our aforementioned friends from Dark Oath will be accompanying us for both dates, while Lvnae Lvmen and Secret Chord will be opening the Lisbon and Porto nights, respectively. We are honored to be able to share the stage with these three great bands. Nuno: There will also be some surprises, namely some stuff we never worked with before and some stage performance designed to match the concept of our album. Everything is coming together to make these shows two epic nights to remember. Besides those two special release shows, can we expect some more Moonshade shows in the near future? Maybe coming to The Netherlands? Nuno: We would be absolutely delighted to visit The Netherlands anytime soon. If any promoters are interested in booking us over there, please let us know, so we can talk about it! During 2019 we should be hitting some stages for sure. Just keep an eye on us to know all about this. Any other future Moonshade plans you can already tell us something about? Daniel: Without disclosing too much, there might be some form of audiovisual content to hit the internet sometime in early 2019, as well as some more live dates that may or may not be contained within the Portuguese borders. We want to keep spreading Sun Dethroned across as many ears as possible. Nuno: First of all we like to thank you very much for your support, as feeling your love and interest is important to us. Follow us on Facebook, Instagram, Spotify… The whole shebang. All the news from Moonshade will be there. Also, make sure to check our site for merchandise and all them goods. We hope to talk to you soon. Cheers!